The Duomo, or cathedral of Santa Maria Assunta, is Romanesque. Construction work started around 1175, over the ruins of the previously existing church destroyed by Frederick Barbarossa in 1155. The new church was consecrated by Pope Innocent III in 1198 and reached completion between 1216 and 1227. 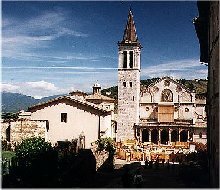 But the 11th century church that was destroyed by the emperor had also stood on a previous church, built in either the 8th or 9th century, dedicated to St Primiano. All that remains of this church is the crypt under the Cappella delle Reliquie. The existing façade is the result of a 1200 extension of the previously existing front, adding the two upper exterior rose-windows, the three small rose-windows below, the blind ogival niches and the mosaic at the top. The mosaic is by a certain Solsternus (1207), who preferred the title of “doctor” over the “magister” usually used by artists. The mosaic represents Christ enthroned in the act of blessing, flanked by the Virgin and St John the Baptist. The central rose window, one of the most ornate in Umbria, is from the 12th century period of construction. It is set inside a square whose four corners bear the symbols of the Four Evangelists. This square is in turn supported by a blind gallery of five small columns and two telamons. The style of the cornice above the window blends surprisingly well with that of the portico added to the building between 1491 and 1504 by Ambrogio di Antonio Barocci of Milan and Pippo di Antonio of Florence, with its five arches flanked by two pulpits. Next to the portico rises the massive 12th century bell tower, which also served defensive purposes, built in large square blocks mostly recycled from previous buildings in the area. The bell chamber, designed by Cola da Caprarola, was added between 1512 and 1515. Next to the main entrance there is the richly carved, walled entrance of the previously existing 9th century cathedral, dedicated to St Primiano. In 1638 Cardinal Francesco Barberini commissioned Luigi Arrigucci to completely refurbish the interior of the church in the Baroque style, thereby accomplishing also the will of his uncle Pope Urban VIII (Maffeo Barberini), who had been bishop of Spoleto from 1608 to 1617. A bronze bust of the pope by Lorenzo Bernini (1640) is above the entrance within. The Baroque renovations widened the lateral naves and the transept, leaving intact only the Romanesque flooring of the central nave and central apse. Works carried out in the 19th century employed the neo-Classical architect Giuseppe Valadier, who designed Piazza del Popolo and the Pincio in Rome, to create the altars and doors of the church. Immediately to the right there is the chapel of Bishop Costantino Eroli, which until1845 was used as a baptistery. It contains fine frescoes by Pinturicchio (1497). The adjacent Eroli burial chapel leads to the Cappella dell‘Assunta, started by Costantino Eroli e and completed by his successor Francesco Eroli. 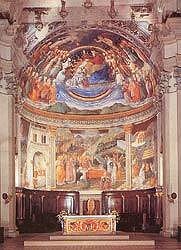 The decoration of the cross-vaulted ceiling has recently been attributed to Giovanni da Spoleto (early 14th century), while the wall frescoes are by Jacopo Siciliano (1540-50). On the right hand side of the right arm of the transept there is the funerary monument of Giovanni Francesco Orsini, by the same architect who designed the portico: Ambrogio Barocci (1500). It originally stood in the Orsini chapel but was clumsily reassembled in its present location. Opposite there is the funerary monument of Fra‘ Filippo Lippi (1406 - 1469), who died here in Spoleto while he was working on the frescoes in the apse (1467-69). The monument was designed by the artist’s son Filippino Lippi and commissioned by Lorenzo de’ Medici but it was not actually made until 1490 by an unknown Florentine sculptor. There follows the sacristy and then the Cappella della Santissima Icona. This chapel was designed in 1626 by Giovanni Battista Mola and replaced a previously existing chapel. The altar of precious marbles contains the icon for which the chapel was created, an 11th or 12th century Byzantine image on wood of the Madonna, in the Haghiosoritissa mode. The inscription on the edge of the gilded copper border reads that the work was crafted in Byzantium. Frederick Barbarossa gave the work to the city in 1155, as a sign of reconciliation after he had destroyed the cathedral. The central Romanesque apse contains a magnificent cycle of frescoes by Filippo Lippi. His assistants, Fra‘ Diamante and Pier Matteo d‘Amelia, completed the Crib section of the cycle, started by their master and left unfinished when he died. The ‘Annunciation’, ‘Dormitio’ and the ‘Crowning of the Virgin’ are entirely by these two pupils..
Like the other altars in the church, the high altar was designed by Valadier and donated by Pope Pius VI. The four columns are in eastern granite. The Cappella del Sacramento, to the left of the presbytery, was built at the end of the 16th century and decorated two centuries later. The Cappella di Sant’Anna is 14th century and was entirely decorated with frescoes in 1597. During the works to enlarge the building in 1644, the chapel was cut. At the end of the 19th century the frescoes were removed to show the previous 14th and 15th century decoration. The Cappella delle Reliquie gives onto the left hand nave. It was added in 1540 to house the icon and other precious vestments in inlaid cupboards. Only the face of the cupboards remain since the remaining sections were used to make the pews of the choir. The wooden sculptures and the altar backing are both by Giovanni Andrea di Ser Moscato and Damiano di Mariotto (1545-54). The niche of the left hand nave after the altars designed by Valadier contains one of the most important works of the entire Duomo: the ”Crucifix on painted parchment and applied to wood by Alberto So[tii] (1187). This came from the church of San Giovanni e San Paolo, where a number of frescoes by disciples of this master have been brought to light. A number of important documents are kept in the Archivio Capitolare, including the finely illuminated ‘Leggendari’ of St Felice of Narco (12th century) and of St Brizio (13th century). There is also a letter from St Fancis to Brother Leone, written by the saint himself, from San Simone.